Cook the lentils with some water, till they are 3/4 th done. Add the chopped snake gourd. Add extra water only if needed. The gourd releases liquid while cooking. Cover and cook till the lentils and snake gourd are done and the liquid is completely evaporated. Make sure they don’t get overcooked and mushy. Switch off heat and let cool. Grind the coconut along with cumin seeds, chilli, garlic and shallots coarsely. Keep aside. Heat oil in a pan. Add mustard seeds. When they start to splutter, add the curry leaves, followed by chilli powder and turmeric powder. Stir for a few seconds. 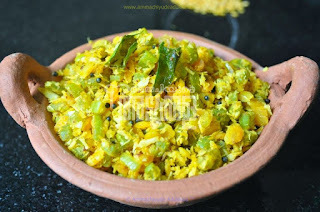 Tip in the lentil – gourd mixture along with salt and mix well. Add the ground coconut and mix well. Switch off heat. Serve with Rice.